According to a recent BrightLocal survey, local search and organic search deliver the greatest Return on Investment (ROI) for businesses over any other digital marketing tactic. Because of this, Google My Business is so important to use for your advisory firm! promises to help local companies get more visibility (and search engine accuracy) than ever before — but is it worth the effort? Google My Business (GMB) is a free tool offered under the umbrella of other Google suite products. Your GMB profile is the profile or listing that shows up on the right side of Google when someone searches for your business or keywords related to your business. Your listing includes pertinent information to searchers such as contact information, hours of operation, events, and more. Therefore it’s crucial that you optimize your Google My Business listing once it’s claimed and verified (we’ll get to that in a minute). Setting up your GMB listing is incredibly beneficial to financial advisors and it’s something that we at Twenty Over Ten consider a necessity. 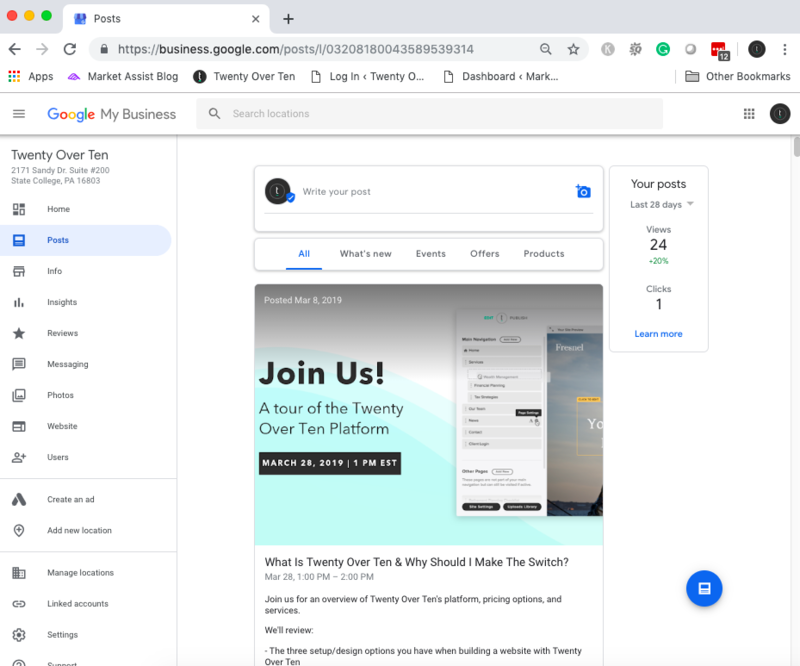 Since you need prospective clients to find your financial services easily online, Google My Business helps to make this connection. 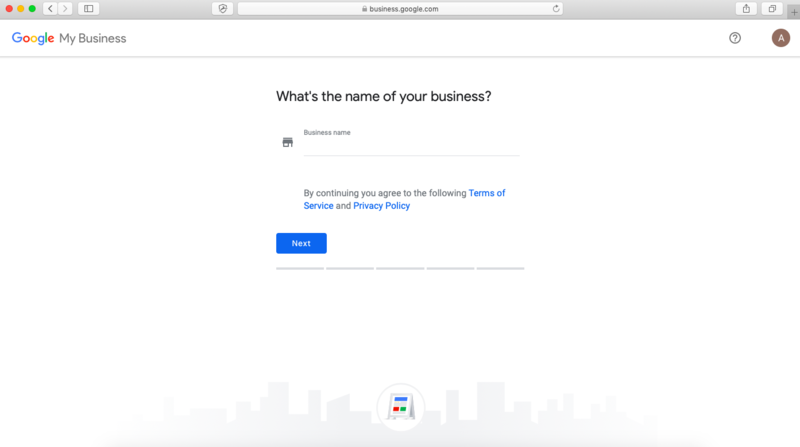 In order to get started with Google My Business, you’ll need to either sign-in with your Google business email or create one. We promise this process takes less than 30 seconds, it’s painless! What Are the Benefits to Using Google My Business? When it comes to boosting your rankings in local search, Google My Business is going to be a key factor. At Twenty Over Ten, we feel that the pros of using GMB far outweigh the cons, and today we’re sharing a few of the main reasons why. On average, complete google my business listings get 7x more clicks than empty ones and are 50% more likely to lead to purchases. 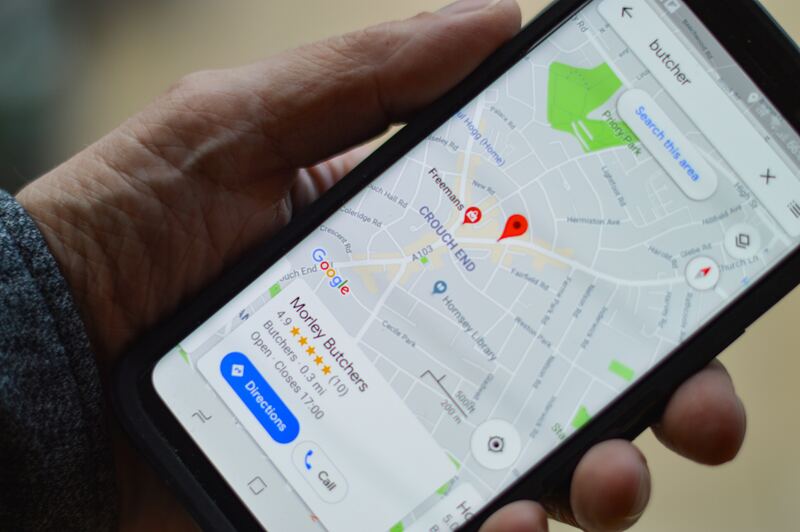 If you have a live verified Google My Business listing and you keep your listing updated, then you can basically guarantee that your business’ information will be correct online, which then, in turn, turns into any third-party apps that may use your information, as well. You will have the chance to update your business’ name, address, phone number and other specifics that you may want to include. Another great thing about Google My Business is that you can also include other information, such as frequently asked questions, events, appointment URL, and more. When you keep things consistent, you establish yourself as a trusted business, and people will know that they can depend on you and will know what to expect from your website and firm! In the image above, Twenty Over Ten client, C.L. 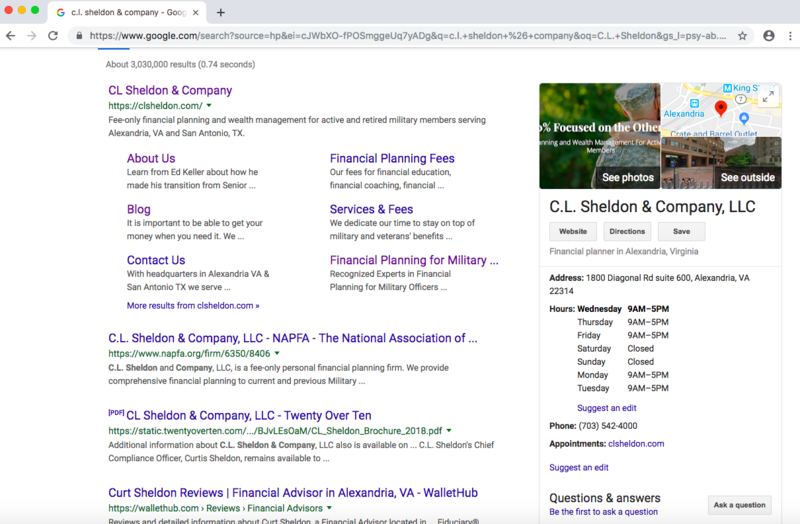 Sheldon & Company, has a GMB page with images, address, hours of operation, a phone number and a URL to make an appointment. Using this free service will obviously improve your firm’s visibility online. Since so many third-party sites rely on Google for information, if you have your business listed, then there is a much better chance that you will show up in others’ search. Additionally, you will be seen as more relevant if you have updated information since Google categorizes things into groups, making your business show up more in local searches. Let’s face it, this is incredibly important, because how are you going to increase SEO if nobody can FIND your information and business. By simply updating your Google My Business information, you can very easily increase your visibility! 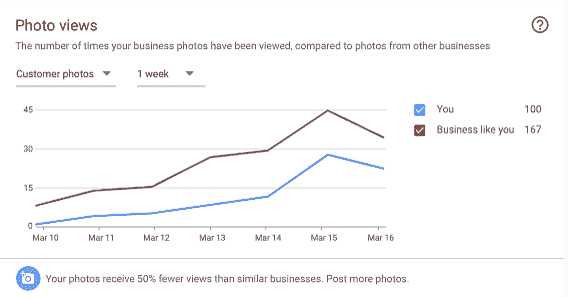 First impressions are everything, and a huge perk of Google My Business is that you have the ability to upload some of your best videos and photos that you want to showcase. 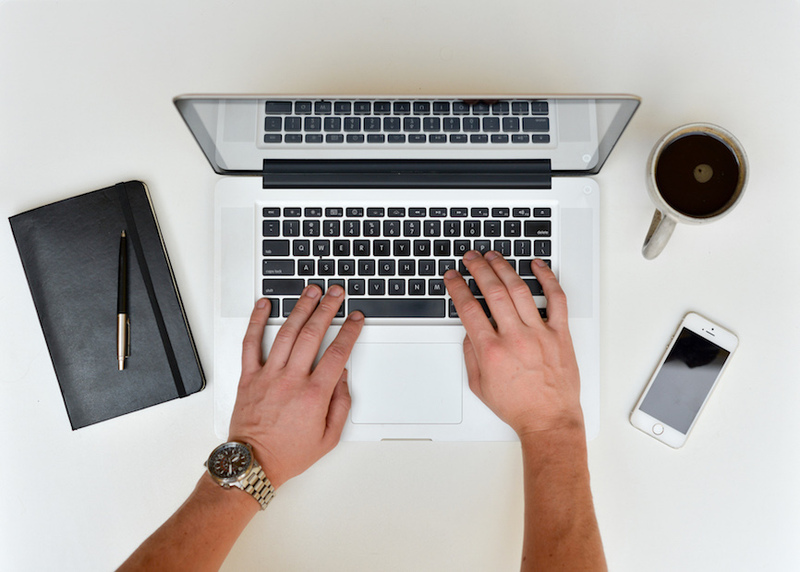 Did you know that 55% of visitors spend less than 15 seconds on your website? This statistic is huge because it means that you don’t have a lot of time to draw them to your website, which means that you need to quickly capture the attention of your audience and convert them from prospects into clients. The great thing about this is that whatever you choose, you have full control over the images your customers see when they encounter your business for the first time, which will lead to much more powerful impressions that your audience is more likely to remember. 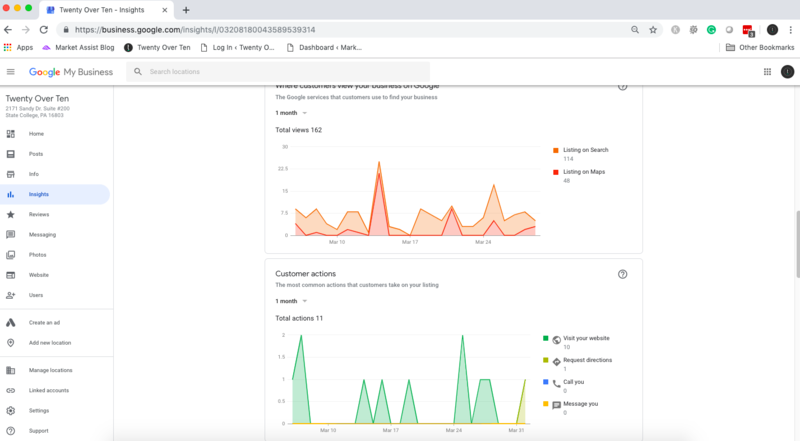 GMB also offers businesses that have a listing access to an insights panel, which shares analytics and data that show exactly HOW and WHEN people are finding your website. Armed with this kind of data, you will be able to see where customers are viewing your business on Google – maps or search, the actions they took on your listing, and more! A great and somewhat newer perk for GMB listing owners is the ability to create “posts,” or content that search users will see when checking out your business. For example, your firm might be offering a special promotion on tax preparation services for a limited time, which can, in turn, drive more sales. It’s also a good idea to use articles that provide value to your customers, either work that someone on your team has written, or maybe you want to share a third-party article. This section is pretty much free advertising, so utilize it in a way that best serves business! Learn more about how to use Google Posts. If your company uses an online meeting scheduling app to make appointments with clients then you’re in luck! Google My Business also allows you easily pop in an appointment URL to your listing so searchers can quickly book an appointment through your listing instead of navigating to your website, etc. This is so convenient for customers looking to book meetings, so this is just another perk to using this free tool! 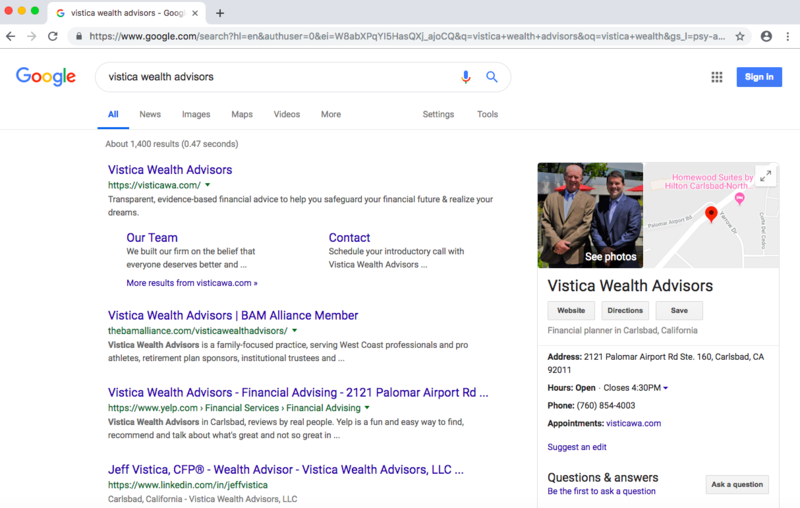 You can see above that Twenty Over Ten client, Vistica Wealth Advisors has an “Appointments” option, where you can simply click on the link, visticawa.com, and will be able to easily make an appointment to speak with an advisor after you are directed to the contact page. Working with financial advisors day in and day out a trend we’ve picked up on is that the majority of clients are referrals from family, friends, etc. In 2019 businesses will start to see more of a trend in online referrals vs. word of mouth. That’s why your online reviews are an extremely important part of your firm’s SEO strategy. And in all honesty, online reviews in our industry has been somewhat controversial and has been previously condemned by the Securities and Exchange Commission (SEC). In recent years, however, the SEC has relaxed the rules and allowed financial advisors to cultivate reviews (with some strict stipulations). 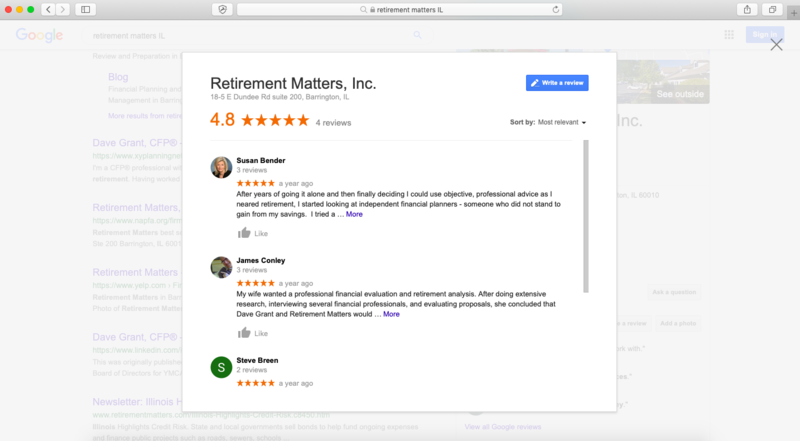 Google is the perfect place to stay compliant and gain valuable reviews. Just remember: responding to, editing or suppressing a review is a violation of the SEC rules. We know, we know, there are tons of online review sites such as Yelp, Angie’s List, Facebook, etc. However, Google reviews is what we recommend focusing your time and effort on because it will really give you the boost you need to improve your local SEO. So is Google My Business worth the effort? We would say, DEFINITELY! It really doesn’t require a lot of effort, so why wouldn’t you use it? Of course, nothing is perfect, but when using it, you have the ability to reach so many more potential customers in a way that you would not be able to otherwise, and hopefully convert them into clients! Ready to Jumpstart your Firm’s Local Presence? At Twenty Over Ten, we can help! 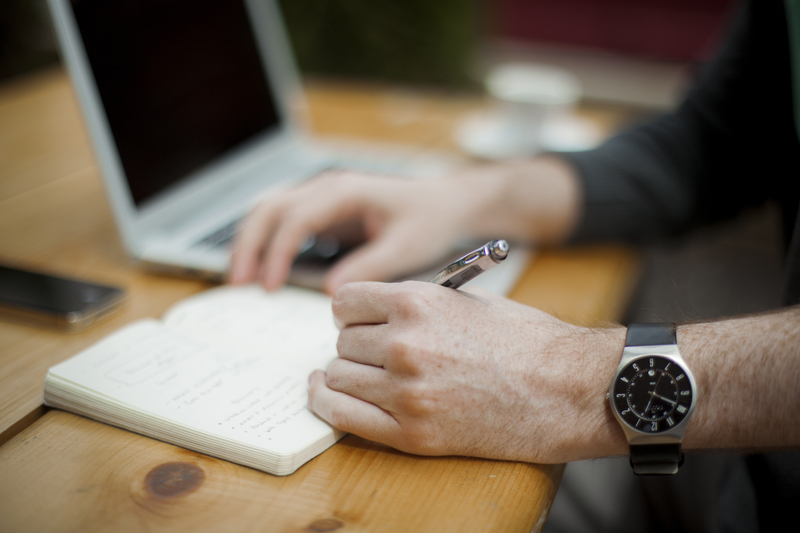 Our team of experts can assist in all aspects of your business’s SEO!